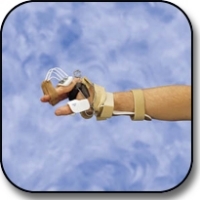 This model dynamically extends the wrist and finger IP joints, flexes the MP joints and assists the thumb into abduction/extension; it can be adjusted to accommodate wrist tension and MP flexion bar tightness. Tension may be adjusted at hinge. Weight: Less than 7 oz. Specify right or left side. Measure width of hand at MP joints in inches. If the hand measures between sizes, order the large size. Post-wrist fractures and crush, tendon and nerve injuries with IP extension involvement. #707BL - Small, 2-1/4\" to 2-3/4\"
#707BR - Small, 2-1/4\" to 2-3/4\"
#707CL - Medium, 2-7/8\" to 3-1/4\"
#707CR - Medium, 2-7/8\" to 3-1/4\"
#707DL - Large, 3-3/8\" to 3-3/4\"
#707DR - Large, 3-3/8\" to 3-3/4\"